The liturgical memorial of Blessed John Paul II (1920-2005) is honored today. In history and in English, John Paul was known as Charles Joseph Wojtyła who was born on 18 May 1920 in Wadowice, Poland. He was without family very early in life. Wojtyła was a man of the people: he knew poverty, war, ideologies against human dignity, hard work, a love of the theater and the arts. Called to serve God as a priest he studied in secret. When he was ordained priest and completed his theological studies in Rome, the Cardinal assigned him to pastoral and academic ministries. He was especially concerned with the formation of youth and married couples. Wojtyła was given the grace of being an auxiliary bishop of Kraków attending the sessions of Vatican II and by 1964 he assumed the responsibilities of being Archbishop of Kraków and soon thereafter a cardinal of the Roman Church (1967). In what was called the Year of Three Popes (1978), Cardinal Wojtyła was elected pope by the College of Cardinals on 16 October 1978 taking the name John Paul II. 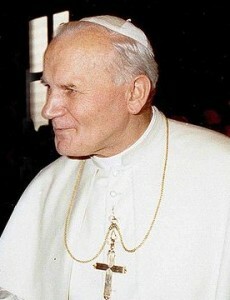 The Polish pope thought of his work as completing the work of the Second Vatican Council which we can see in 14 encyclicals, the re-organization of the Roman Curia, standing up for the marginalized and was staunchly pro-life, he promulgated of the Catechism of the Catholic Church, and established the new Codes of Canon Law for the Latin Church and the Eastern Churches. I would also name among fruits John Paul’s ministry as pope is the approval of the many ecclesial movements, the Theology of the Body, and the demise of Communism. He left us a rich ecclesial heritage in his 27 years as the Bishop of Rome, the Roman Pontiff. John Paul set the papacy on the world stage with 129 pastoral visits to other countries. For several years he gave a witness that a person with chronic illness still has human dignity and worth. In Rome on 2 April 2005, the eve of the Second Sunday of Easter (or of Divine Mercy), he departed peacefully in the Lord. He will be canonized by the Church on 27 April 2014.